I went to a plant sale. I was looking for plants and garden sculptures. I didn't have any particular plants in mind to buy. I wouldn't have looked twice at the plants I ended up buying if it hadn't been for the way they were labeled. 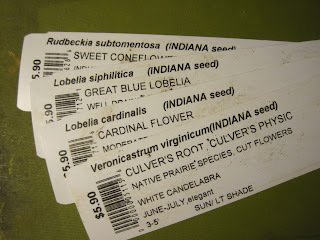 "INDIANA seed" was all I needed to see to decide I should buy these plants, really just seedlings, though I knew little about them and most of what I did know was on the tags. I'm now the proud owner of four new Indiana wildflowers for my garden, if one can own wildflowers. I hope they aren't too wild, yet find my garden suitable enough to be just a little bit wild. To find other posts for Wildflower Wednesday, visit our wildflower garden hostess Gail at Clay and Limestone. Your new Lobelia will attract both hummingbirds and butterflies - enjoy your native plants - a wonderful idea. I'm from the Wildflowers are Wonderful school. I use many of them in my habitat garden, much to the delight of native pollinators. You will find them good company in your wonderful garden. Getting the local genotype is a goal of wildflower aficianados. Good score! How perfect for your Indiana garden, Carol. That Veronicastrum is one of my favorite plants. All four of those are wonderful plants! Make sure the culver's root and lobelias get regular moisture. Enjoy! I agree, what a great strategy, but then, when I am at the plant center and I WANT a native, sometimes it can be tough to sort them out... better they come from your own native seed as well! I so love the coneflowers... bees love them too! And cardinal flower is definitely another beauty... but yes, it does need plenty of moisture (it's native here too, but as a bog plant). And the lobelia is another favorite of mine! Never heard of culver's root -- looking forward to seeing photos of it in your garden. I'm looking forward to my visit to Nasami Farm nearby, the propagation arm of the New England Wildflower society - all native plants. Beautiful and healthy.